Retired Garda Sergeant Daniel Devlin told the Charleton Tribunal “emotionally, everyone was badly affected” after Garda Gary McLoughlin was killed. A RETIRED GARDA Sergeant has told the Charleton Tribunal that the death of a colleague in the line of duty had “a devastating effect” on officers in Buncrana, Co Donegal. Retired Garda Sergeant Daniel Devlin said “emotionally, everyone was badly affected” after Garda Gary McLoughlin was killed when he was “rammed” by a car driven by Martin McDermott, who was later found guilty of manslaughter. Devlin said that in March 2011 he learned about the connection between McDermott and garda whistleblower Keith Harrison, whose partner Marisa Simms was a sister of McDermott’s, a few weeks before McDermott’s trial for manslaughter. “It was only a few weeks before the trial. Emotions in the unit were a bit taut at that time with that coming up,” Devlin said. Devlin said Harrison made an address to gardaí at the station after the connection emerged. “He in a way maybe was apologising for not disclosing it earlier,” Devlin said. He said Harrison also told him privately that he was very happy working in Buncrana, and the longer he stayed the more difficult it had become to disclose the connection. Following the revelation, Harrison was transferred to Donegal town. Devlin said Harrison’s work was “very good” and he was not aware of him being victimised in any way. The connection came to light after Harrison reported an incident in Churchill, Co Donegal of alleged domestic violence between his partner and her ex-husband. Garda Peter Kearins, who responded to the call in Churchill, said that when he got to the scene, he “didn’t believe that threat was as serious as it had been made out to be”. Tribunal chairman Mr Justice Peter Charleton said that there had been “a threat of violence” and gardaí were obliged to respond. Earlier, the tribunal heard that Harrison used the Pulse system over 30 times to look up his partner’s details after an anonymous letter led to a HSE inquiry into the welfare of her children, the Charleton Tribunal has heard. 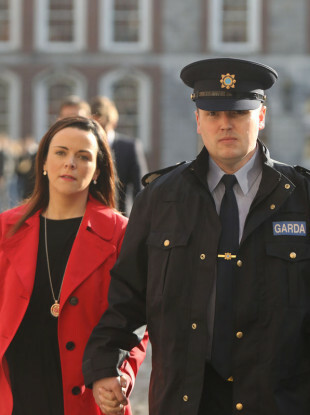 Harrison used the garda computer system to check on Simms in the wake of the anonymous allegations in early 2012. In its current module, the tribunal is looking at contacts between gardaí and Tusla, the Child and Family Agency, in relation to Harrison. Retired chief superintendent James Sheridan said that after he received reports of “a multiplicity of checks”, he issued a directive on data protection to all officers in the region, and met with Harrison. “He could not give me any valid reason for conducting the checks on Marisa Simms and he gave me an assurance that he would cease,” Sheridan said. Mark Harty, senior counsel for Harrison, said that the figure of “over 30″ Pulse checks was inaccurate, and at the time in question there were 22 checks, dating from 2007. He said Harrison made the majority of checks to see who else was making entries relating to Simms, and “he believed at the time that they were under surveillance, both he and Ms Simms”. Asked by the chairman, Mr Justice Peter Charleton, if Harrison was under surveillance, Sheridan replied: “Absolutely not.” Sheridan said he was asked if he would accept Harrison on transfer to Sligo in February 2011, and was happy to do so as there was a personnel embargo and he welcomed the extra resource. The following month, he learned in a garda bulletin that Harrison was transferring to Buncrana in north Donegal. Harty said senior officers in Limerick and Portlaoise had refused to accept Harrison on transfer from Athlone. Sheridan agreed that this was “not commonplace”. He said that in March 2011 he was informed of an incident in Churchill near Letterkenny involving Harrison’s partner and her ex-husband, as a result of which he met with Harrison. Harrison had travelled to Churchill in a garda car while off-duty, because of the incident. Harrison’s partner was a sister of Martin McDermott, who was later convicted of the manslaughter of Garda Gary McLoughlin following a high speed car chase. Harrison had not previously informed his superiors that he was in a relationship with the sister of the man facing charges relating to the homicide of a local garda. Sheridan said that while Harrison’s partner was not in any way responsible for the actions of her brother, he had to “manage the circumstances”, and arranged to have Harrison transferred away from Buncrana to Donegal town. Sheridan said he rejected utterly assertions by Harrison relating to the meeting. ”To say that I was angry or treated him in any way disrespectful (sic) is a gross misrepresentation of how that meeting was conducted,” Sheridan said. He said he did not threaten to transfer Harrison “down the country” or send him to the Sligo-Leitrim division. “I did mention to him that he was originally to go to Sligo,” Sheridan said. “The homicide of Garda McLoughlin will never be forgotten, and he will always be associated with Buncrana,” Sheridan said to Harty. Email “Retired garda says colleague's death in line of duty had 'devastating effect' on officers ”. Feedback on “Retired garda says colleague's death in line of duty had 'devastating effect' on officers ”.